How to get enjoyable moment in NBA 2K17 with the release of game? Basketball fans are in a huge number all around the world and they are all eyeing for the latest NBA 2K17 MT. If you want to buy NBA 2K17 MT, please use our site www.u4nba.com which will give you the best service. For basketball fans, NBA 2K17 is definitely a game that they don't want to miss. Some notable new features of the latest NBA 2K version include classic teams and several mode. This article is mainly about the "All-Time College Bundle" DLC. Hope it can help you enjoy the game. "NBA 2K17" features a wide array of teams for players to choose from, and they can expand the selection further by getting the "All-Time College Bundle" DLC. As the name of the DLC pack suggests, it adds different college teams to the game, and there are 10 of them to be exact. The 10 college teams included in the DLC pack are Arizona, Connecticut, Georgetown, Georgia Tech, Illinois, Kansas, Louisville, Michigan State, Oklahoma and Wake Forest. 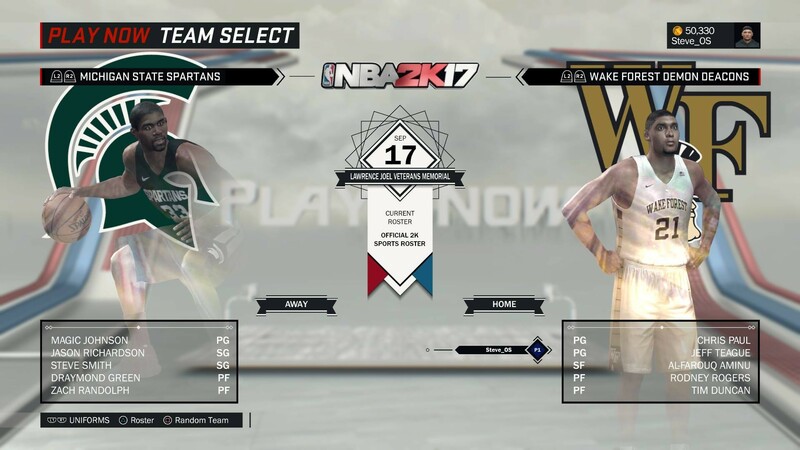 The college teams players can get for "NBA 2K17" will not feature era-specific rosters, and instead, the squads will be made up of some of the best players in that particular school's history. Complete rosters of the additional teams included in the "All-Time College Bundle" can be seen over on Operation Sports. The additional college teams will give basketball fans numerous opportunities to use different star players together. For instance, Wake Forest features the incredible pairing of Chris Paul and Tim Duncan, a combination that could really be devastating on the hardwood. Georgetown also features a pretty impressive roster filled with highly-skilled centers such as Patrick Ewing, Alonzo Mourning and Dikembe Mutombo and then manning the backcourt for them is none other than newly minted Hall of Famer Allen Iverson. Other notable players who will be playing for their alma maters include Earvin "Magic" Johnson running point for Michigan State, Ray Allen raining down jumpers for Connecticut and even Blake Griffin attacking the rim for Oklahoma. It's worth noting that the different teams included in "All-Time College Bundle" DLC will be usable only in Quick Games, so they are for exhibition purposes only. Players can get all 10 college teams included in the "All-Time College Bundle" DLC for $14.99, or they can also purchase specific teams. Individual teams can be purchased for $1.99. More NBA 2K17 news is shared on u4nba.com. Like and Follow our news page for more stories and to stay up-to-date with the latest happenings. 10 different college teams included in NBA 2K17's 'All-Time College Bundle'. "NBA 2K17" is available now for the PC, PS3, PS4, Xbox 360 and the Xbox One.